It is a real pleasure for me to attend this breakfast meeting. 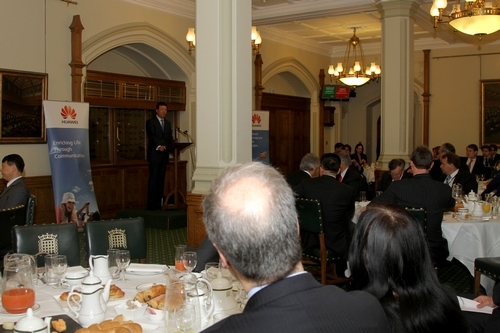 I have warm memories from two years ago of my first breakfast that was kindly hosted for me by the Conservative Party China Group. I was delighted late last year to repay this kindness with a lunch for some of you at my Embassy. I regard these meetings as most valuable to our better mutual understanding. Chairman Graham has suggested a topic for me to talk about today. The theme is the future of China-UK economic cooperation. This is a most important topic so I am very glad to share with you my views. We all know that a sound bilateral relationship is essential for the growth of economic ties. This is why I propose to start by giving a quick overview of China-UK bilateral relationship as a whole. Then our economic co-operation can be understood most clearly. This year marks 40 years of full diplomatic relations between China and the UK. By "full diplomatic relations", we are talking about the ambassadorial ties built in 1972, presided over by Prime Minister Edward Heath. And the fact is, this China-UK partnership went back to a much earlier time. That was when we exchanged chargé d'affaires in 1954 under the premiership of Sir Winston Churchill. And both these two milestones saw vision and leadership provided by Conservative statesmen.
" One no longer has doubts or misgivings at the age of forty." This means that a man of forty years old is sensible and mature. So is a forty-year old bilateral relationship. Looking back there have been many challenges in our relations during those 40 years. But there have been outstanding successes. One highlight was the successful resolution of the question of Hong Kong. Another was the creation of a comprehensive strategic partnership. · Our premiers' annual summit. The people-to-people dialogue was newly launched last week. This was during State Councilor Madame Liu Yandong's visit to the UK. At global level, our two countries now share growing common interests in international affairs. We have developed ever closer coordination and consultation. The key areas are in world economic governance, global security and non-proliferation. Contacts between our peoples have never been more frequent. Every year, more than one million tourists travel between our two countries. Hundreds of cultural exchange programmes are held. On top of that, the UK hosts tens of thousands of Chinese students and dozens of Confucius Institutes and Classrooms. All these have deepened understanding and friendship between our peoples. · In 2011, our bilateral trade was 58.7 billion US dollars. · That was an increase of 28.8% year-on-year. · Among UK's top 15 export markets, China is the fastest growing one. · We have set the goal of raising bilateral trade to 100 billion US dollars by 2015. I believe we are on track to reach that target. · By the end of 2009, China's non-financial investment in the UK had totaled 620 million US dollars. · By 2011, it surged to 2.3 billion US dollars. · This means the year 2011 alone saw 1.13 billion US dollars of Chinese investment in this country. Let me also highlight progress in the manufacturing sector. MG Motors UK is now owned by Shanghai Automotive Industry Corporation. Investments by SAIC have created a new business model: "designed in UK, manufactured in China and assembled in UK." This innovation revived a famous British brand and set it on a path to renewed strength. It also created more than 400 local jobs. Since I came to Britain two years ago, I have traveled across the country. Through this I have gained a better understanding of the strengths of British companies. I have used this knowledge to communicate the complementarities of our economies. I have done this through many speeches, TV and radio interviews and publication of numerous articles in British national and local newspapers. I have brought together my knowledge of the Chinese and British economies to promote my belief that China-UK economic cooperation has great potential. To fulfill the potential, we need to seize opportunities in the following aspects. First, the opportunity for trade in technology and joint R&D. China is restructuring its economy and upgrading its industries. We need to import sophisticated equipments and advanced technologies in great quantities. For example, the UK is a world leader in renewable energy and bio-medicine. I encourage the UK to sell more high-tech products to China. China gives top priority to technological innovation and has adequate funds available. We are happy to conduct joint research with foreign countries and share the results. I hope more British companies and universities will cooperate with Chinese partners in setting up joint R&D centres or specific research projects. Second, the opportunity for two-way investment. China welcomes British companies to make investments in China's modern services sector, green industry and high-end manufacturing. We particularly welcome British investment in China's Northeast and Northwest. Meanwhile, China will continue to encourage Chinese companies to invest in the UK. The UK is one of the few Western countries opening its infrastructure to Chinese investment. Our cooperation in this regard has kicked off with a good start early this year. The China Investment Corporation bought 8.68% of Thames Water with an estimated market price of 1.2 billion British pounds. This one transaction alone is more than the total Chinese investment in the UK last year. Another successful case comes from January 2012, when Chinese telecommunications equipment and services company Huawei signed a deal to acquire the Centre for Integrated Photonics(CIP), a world prominent chip designer based in Ipswich. And recently, I heard Land Rover planned to open a facility in China. If so, that will create a new and positive business model. This will combine capital from a third country with a great British brand and technology; in turn the vehicles will be produced and sold in China. Third, the opportunity for financial cooperation. Finance is a pillar of the British economy. London is the number one financial hub of the world. China is also making an all-out effort to develop its financial sector. Progress towards sound and dynamic financial sectors and exchanges will certainly boost growth of the real economy. · The Industrial and Commercial Bank. · And the Bank of Communications. Yesterday evening, I attended the launching ceremony of ICBC London new office. The fact is for all of these Chinese banks, we have seen their business rapidly growing in the UK. Another example of financial potential is with the international advance of the Chinese currency. China has quickened steps to internationalize its currency, the RMB. 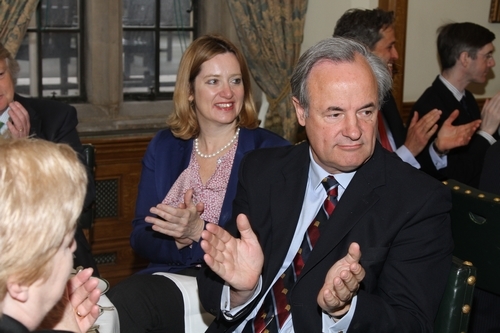 London has expressed its ambition to become an off-shore centre for RMB settlement. In fact London is already on track to this goal. 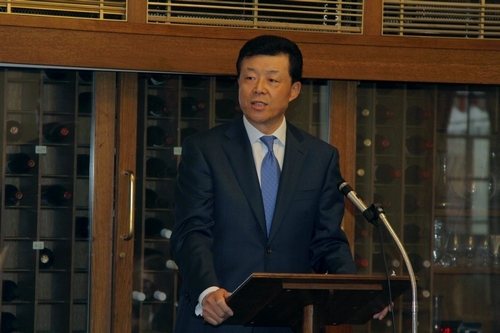 On 18th April, the City of London officially launched its programme aimed to become an off-shore centre for RMB trading. On the same day, HSBC issued its inaugural 2-billion 3-year international RMB bonds. The original plan was to issue 1 billion RMB. Yet the immense interest and great demand from the markets raised the sum to 2 billion. This trade broke new ground by being the first of its type to specifically target distribution to European investors. It was a major step forward towards London's goal of becoming off-shore center for RMB trading. It was also a marked progress of RMB internationalization. All these developments I have highlighted undoubtedly hold out great prospects for China-UK financial cooperation. The fourth opportunity for increasing our economic ties is to strengthen SME cooperation. SME cooperation is an important part of our economic links. Many British SMEs have specialty products and technologies popular in the Chinese markets. I myself visited some of them. We stand ready to facilitate cooperation between our SMEs and help them grow together. Last but not the least, we face great opportunities in cultural cooperation, in particular creative industries. Creative industries are high value-added and environment friendly. They not only generate huge profits but also create many jobs. More importantly, they are emerging industries and have great potential. China wants to move up the value chain of manufacturing. Our goal is to turn from a production base into a design centre. To achieve this, we need to press ahead with creative industries. In recent years, the value-added of China's creative industries has grown at annual rate of more than 17%. This growth rate is higher than that of China's GDP. In summary, creative industries have become an important area of growth as China transforms its economy. Another reason that I believe we face great opportunities in this area is that UK is the birthplace and a recognized world leader of creative industries. Creative industries now contribute around 7% of British GDP. This gives them an equally important position in the British economy as the financial sector. Moreover, it is the most dynamic sector of the British economy. As I suggested, our cooperation in creative industries face great potential. It also serves our development plans. I believe it will become a new highlight in our future economic cooperation. 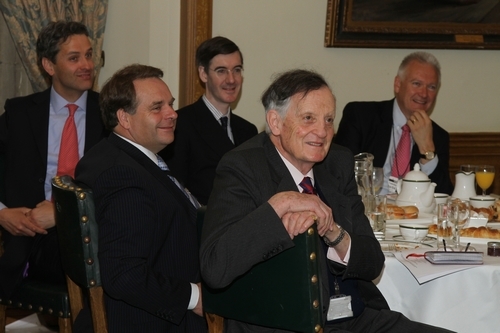 Friends from the Conservative Party, much has happened since our first breakfast two years ago. What makes today's breakfast different from the one two years ago is the Conservative Party is in power! This means you have a much bigger means to influence events. Chairman Clifton-Brown asked me to talk about business ties between our countries. 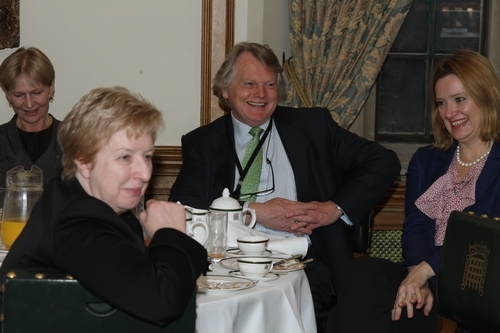 This means I feel sure we share a common objective of examining ways to boost China-UK economic ties. As a result I hope you will agree with the ideas I have proposed this morning. In turn I hope you can use your power to help drive forward ever closer economic ties and play a bigger part in promoting win-win cooperation between China and the UK. Thank you and I am glad to take your questions.